The Nations Number One Source of Investment Grade, American Classic Cars, Muscle Cars and Custom Hot Rods. THIS VEHICLE IS LOCATED IN OUR PA. SHOWROOM, FREE SHIPPING AND 1 YEAR WARRANTY !!!!! CLICK DIRECTLY ABOVE FOR MORE PHOTOS AND A VIDEO OF THIS VEHICLE !! THIS VEHICLE IS LOCATED IN OUR PA. SHOWROOM, FREE SHIPPING AND 1 YEAR WARRANTY !! 20 Inch Custom Foose Wheels. Digital AM/FM Radio. Magnaflow Mufflers. 2-Tone Red and Tan Interior. Digital Fuel Gauge. Matte Black Chevrolet Air Cleaner. 350cid Small Block Chevrolet Crate Motor. Digital Oil Pressure Gauge. Matte Black Chevrolet Valve Covers. Accel Super Stock 8mm Plug Wires. Digital Speedometer. Mechanical Fuel Pump. Aftermarket Radiator with Trans Cooler. Digital Tachometer. New Milestar MS932XP Tires. All New Digital Gauges. Digital Voltmeter. Painted Drip Rail Moldings. All Seatbelts are Present. Digital Water Temperature Gauge. Power Brakes. All Steel Bed. Driver and Passenger Side Mirrors. Power Steering. All Steel Body. Dual Exhaust. Red and Tan Upholstered Bench Seat. Aluminum Water Pump. Edelbrock Performer EPS Aluminum Intake. Red and Tan Upholstered Door Panels. Billet Interior Door Handles. Edelbrock Single Feed 4BBL Carburetor. 650cfm Carburetor. Red and Tan Upholstered Headliner. Billet Window Cranks. Electric Choke. Red Exterior. Black Dash Pad. Electric Cooling Fan. Red Painted Dash. Brakes Front: Disc. Factory Dash. Tail Pipes. Brakes Rear: Drum. Factory Heater Controls. Tan Carpeting. Chrome Alternator. Fuel Tank in Original Location. Tan Sunvisors. Chrome Boxed Exhaust Tips. GM 12-Bolt Truck Rear End. Tilt Steering Column. Chrome Front and Rear Bumpers. Grant Sport Style Steering Wheel. Tinted Side and Rear Glass. Chrome Gas Cap. Heater Lines are Hooked Up. Tires Front: 255/45ZR20. Column Shift. Hedman Long Tube Headers. Tires Rear: 275/45ZR20. Custom 10 Fender Emblems. HEI Distributor. Turbo 400 Automatic Transmission. Custom Grille. 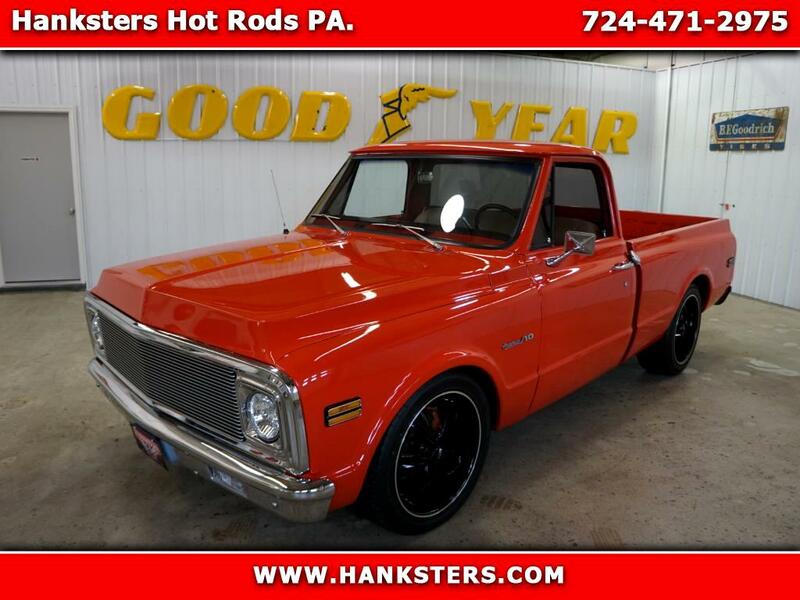 Visit Hanksters online at www.Hanksters.com to see more pictures of this vehicle or call us at 724-471-2975 for PA, or 386-944-9219 for FL, to schedule your visit today. Note: FREE SHIPPING AND WARRANTY IS ONLY ON SELECT VEHICLES AT THE FULL RETAIL PRICE, FREE SHIPPING IS ONLY IN THE CONTIGUOUS US .. Message: Thought you might be interested in this 1971 Chevrolet Trucks C10. Terms and Conditions ©Copyright 2019 hanksters.com. All Rights Reserved Fees and Payments: The signed Sales Agreement and a $500.00 non-refundable deposit shall be sent to Seller within twenty-four hours to hold the vehicle for a maximum of seven days. The $500.00 non-refundable deposit may be made by electronic bank wire transfer, certified bank check /cashier's check, money order, credit card or PayPal. Upon purchase of the vehicle, the deposit shall be applied to the purchase price. Tax, title and license fees will be charged to Pennsylvania residents. Out of state buyers are responsible for registering the vehicle and paying the sales taxes in their home state. Seller will assist buyer with locating a shipping company. It is the responsibility of buyer to choose the shipping company. Buyer is responsible for all shipping costs. FREE SHIPPING IS ONLY ON THE FULL RETAIL PRICE. Seller will not be responsible for the vehicle as soon as the shipper takes possession of the vehicle. In the event of damage or tampering, the shipping company is 100% responsible for anything that may happen to the vehicle during transport. In the event of damage or tampering, Buyer is responsible for filing any claims directly with the shipping company. All vehicles are available for inspection during normal business hours. Please feel free to give us a call if you have any questions regarding the purchase process - we're happy to answer any questions you might have! The full purchase price must be received from buyer within seven days of the Sales Agreement, by electronic bank wire transfer, certified bank check or cashier’s check. This Agreement shall be governed by the laws of the Commonwealth of Pennsylvania, and jurisdiction for resolution of any dispute, enforcement or otherwise shall be in the Court of Common Pleas of Indiana County, Pennsylvania. General Policies: Hanksters specializes in classic and collectible cars. Hanksters has described the vehicle to the best of our ability. However, with all pre-owned automobiles, the condition is subjective, so we recommend that the potential buyer have the vehicle professionally inspected, or personally inspect and test drive the vehicle before purchase. SELLER MAKES NO WARRANTY TO BUYER WITH RESPECT TO THE VEHICLE, EITHER EXPRESSED OR APPLIED, INCLUDING, WITHOUT LIMITATION, THE IMPLIED WARRANTIES OF MERCHANTABILITY OR FITNESS FOR A PARTICULAR PURPOSE. Condition Disclaimer: All used vehicles should be assumed to have some degree of wear. We do not manufacture the product. Each vehicle brand has its strengths, styles, tendencies, and shortcomings. Therefore, despite our best efforts to verify a vehicle's mechanical condition, we are not able to warranty a manufacturer’s workmanship or a previous owner’s diligence in care. We are not a service facility and there are no mechanical guarantees expressed or implied. The advertised mileage represents the actual miles when the car was advertised, actual mileage may differ at time of sale. Legal Disclaimer Information Not Warranted or Guaranteed: The official Hanksters website and all pages linked to it or from it, are PROVIDED ON AN "AS IS, AS AVAILABLE" BASIS. Hanksters MAKES NO WARRANTIES, EXPRESSED OR IMPLIED, INCLUDING, WITHOUT LIMITATION, THOSE OF MERCHANTABILITY AND FITNESS FOR A PARTICULAR PURPOSE, WITH RESPECT TO ANY INFORMATION OR USE OF INFORMATION CONTAINED IN THE WEBSITE, OR LINKED FROM IT OR TO IT. Hanksters does not warrant or guarantee the accuracy, adequacy, quality, currentness, completeness, or suitability of any information for any purpose; that any information will be free of infection from viruses, worms, Trojan horses or other destructive contamination; that the information presented will not be objectionable to some individuals or that this service will remain uninterrupted. No Liability: Hanksters, its agents or employees shall not be held liable to anyone for any errors, omissions or inaccuracies under any circumstances. The entire risk for utilizing the information contained on this site or linked to this site rests solely with the users of this site. Hanksters will not be responsible to fix any vehicle parts or components that are not under warranty and are not held responsible for any injury occurred by motor vehicle operation. Payments are subject to change... ALL SALES ARE FINAL!